Location: So. California I just bought this '58 Lancer from out of Los Angeles. Pretty solid car in the front, but quite a bit of rust in the back for some reason. Built in Los Angeles with a 325 poly, 3 speed Torqueflite, power steering & manual brakes. Seems to have all its original wheels. I'm either going to use some spinner hubcaps or dog dish caps. Trying to figure out the paint scheme I would like to put on it. Any suggestions would be welcome. I'm not a fan of all white - too boring. This car I am going to get running and then get it painted relatively quickly since there isn't a huge amount of work involved to do that. Location: So. California Here are some pictures of the condition of the car. The trunk lid needs to be replaced. Pretty difficult fix there. Same situation with the trunk pan. It probably had a rubber mat covering it all to make it this bad. But the quarter panels just need a minor patch. The interior floors are really nice. Can anyone tell me if these door panels look to be original to this car? It seems odd to have a solid green dash and blue door panels. Location: The Mile High City Hi, Nathan. TRM Code 141 is a green Coronet interior. You have the deluxe interior. In the above images, the door panels look green to me. Maybe the sun has faded them to a blueish color(?). They look original to me. if I am going to change away from a car's original colors. Location: So. California What does a deluxe interior consist of? Is the sombrero part of that option package? The camera is bad about changing the hue. The door panels are definitely blue and the dash is a true green. So it makes me wonder. Blue and green are an odd choice to mix. But I think if I paint the outside mint green that it would go well enough with both the blue and green... maybe. And mint is more of a pastel green so it might look pretty good that way. The other option is charcoal and white, but I think it would look better with more color than that. Location: little rock, AR I have a trunk lid if you can't find one closer than Arkansas. Great looking Dodge!!! Location: So. California It is looking like this one is going to get some buzzard puke on it too. The wife approves the mint/white w/whitewall combo, but I think I prefer the charcoal/mint w/dog dishes. The wife says darker green/black makes it look like an army jeep! So I guess that one is out. I'm looking forward to the day your buzzard starts busting those boulevards again. Location: So. California The more I look at them, the more I like the black and dark green. I made some progress on getting it running. Rebuilt water pump and rebuilt carb. I didn't touch the generator & power steering pump because I want to see if they work first. The air cleaner will be converted to a 4bbl soon so I left it unfinished for the time being. Once I get the electronic distributor & fuel pump setup properly, I should be able to see if this thing runs, and how well. Still ZERO brakes though so it isn't moving anywhere yet. lends itself well to. It is a complimentary color combo. dog dishies, .... it is the old man at the beach in shorts, black socks, and sandals ! trimmed example would really look cool in the sea of over-blinged examples. someone will build a nicely untrimmed 59 Dodge in an unsexy color ? Location: So. California Do you guys have a suggestion for color scheme? This is the original interior fabric, but I am willing to change things around. But I want to keep the door panels as is because they are in pretty good shape. Location: So. California It's alive! I couldn't get the intermediate shaft out of the motor to do the electronic distributor conversion so I made an adapter to mount to the end of the electronic distributor. I fired it up and it seems to run really well. We'll see when I put it under load, but so far it seems quite responsive. The old fuel pump even works well. I have it sucking out of a can right now because the tank has been sitting for who knows how long without even a cap on it, and it is nasty smelling. The fan needs a smaller spacer. The one on there is too long to assemble, and it doesn't work without any spacer. But as soon as I get that sorted and get the cooling system functional, I will put it in gear (with the wheels off the ground) and see if the trans & power steering decides to work or not. Bit by bit, I am determined to get this thing on the road. Location: North Australia Awesome to see this car saved, well done Nate. Keep the pics coming. I am gonna buck the trend, I recon these FL cars look very nice in all white, just my opinion, and I don even know why (especially a 58 Doggie 2drht!). the green and white shown previously and that fabric on the seats and door panels. This is the epitome of what MAKES a "George Jetson" car so cool. Location: little rock, AR I would have 1 of each and enjoy them all. But reality is $$$, time and space. Not many people liked the '61 but it now has a following. I, like DOC enjoy the strippers but will buy anyone of them even if I don't keep them. We all do what we can to save a FL car. Let the trash talk come from those that don't see the beauty that Virgil Exner left us. The Mopar engineers gave us some of the best engines and transmissions ever to be made. I hope to see DOC and ole Buzzard Puke running the roads someday. the place decked and tarped for the winter by the end of this coming week ??? all, things are FINALLY getting to a place of functional workshop ! Location: So. California You should start a thread in the nether region on your T motor build. Many of us would enjoy seeing what you are doing. But if my vote counts for anything, and I'm sure it doesn't; I vote you get the Plaza done first. Location: Parts Unknown I see the Plaza getting finish bodywork and paint prep in the next year. bodywork and prep doesn't require as much commitment. overtaken my fin car interest. The T is way more fun. Location: little rock, AR The Plaza will give you just as much joy driving it. It will be a lot safer. Screw the paint, drive it. Both of you guys start driving the survivor cars!!!! That's what I'm doing with this one, for now!!! "Does it have a Hemi ?" of land speed records with it." "Do you do a lot of carmshows and pretend it's the 50's ?" "I just love Lost in the 50's !" Location: little rock, AR I had a '31 Ford Coupe and someone had to have it. Location: So. California Converted the car to disc brakes and redid all the front lines, but not shown in picture. I used a disc master from a '73 Dart. If I end up converting the car to power brakes, I will do a remote reservoir on it, but I wanted to try it out with manual brakes first. Location: So. California Swapped to 2.76 gears in the back. Still need to cut down the axles and adjust the end play. The oil in this axle wasn't 90 weight. I think it was straight 30 weight motor oil. I couldn't get a good price on replacement 11x2" brakes so I decided to swap to 12x2.5" brakes from the Windsor parts car instead. I am in a hurry to get this running and moved so I didn't take the time to paint the rear axle housing & springs. Location: So. California I replaced the gas tank and fuel sender. The tank was workable, but I didn't want to deal with all the crud & rust inside so I just replaced it. Finished the brake & axle job except I still have to wire up a mechanical brake switch. I got all the exterior lights working, but not a single electrical device works on the interior of the car. I ordered a new voltage regulator that should fix the no-charge issue. There is a strange coolant leak from the back of the motor. It isn't from the intake or the head gasket. The only place I can figure it coming from is a block plug on the back of the block. Drat, that is a tough one to fix, but hopefully I can seal it with a small amount of copper seal. The freeze plugs on the sides of the block are not rusted and seem to be in good shape. I took the car for it's maiden run tonight. This 325 poly motor is really strong! This is likely the strongest forwardlook car I own. Even with the 2.76 gears, it gets up and moves quite well. The trans, front suspension and power steering work great untouched. The brake pedal is still a little spongy because I am having trouble getting all the air out for some reason, but the brakes work great other than that. I should be able to get all the air out with time. Next on the agenda is to fix the bench seat adjuster catch. It isn't catching so the front seat slides back and forth continually. It's enough to drive me insane! Location: Buena Park, CA Man, you are really moving along on this '58! Very impressed Nathan! Location: So. California Thanks Dave I am probably more motivated than usual because I purchased a 392 hemi from a '57 New Yorker that is sitting in the back of my wagon that I can't unload until this car is moved. Location: Dorset, England I'm biased, but I haven't yet seen a colour combo that I prefer to the white over mint on my own '58 Dodge. We share the same deluxe interior. It goes really well with the mint. I wish mine had your lovely cloth design. The 2bbl 325 in mine is perky too. A fine motor. Location: So. California Thanks for the pics John. You have the same bluish door panels that I do, so it looks like they do fade from green to blue quite easily. Either that, or that is the color they were made. Yeah, the discs are pretty much required if you want to be able to drive in Los Angeles. Too many crazy drivers out here. Your steering wheel is making me very jealous! It looks new. I think most of my steering wheel is on the floor now. That's a really good reason . . . . ha ha ha! What does a deluxe interior consist of? Hi, Nathan - sorry about the late reply. Sombreros were optional with all interiors! The "upgrade" Coronet interior had dippity-doo swishtity swoops (to use the technical term) in the mylar portion of the door panels. 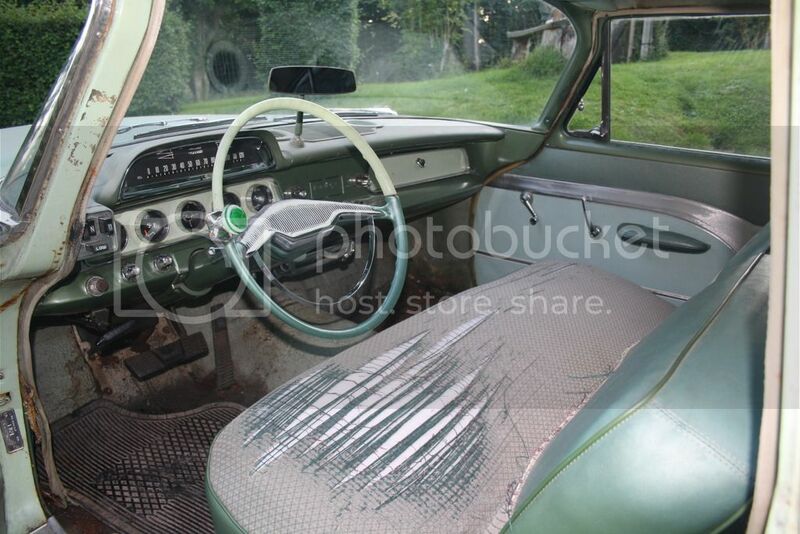 They also got setback dippers too, instead of the straight seat back of the standard Coronet trim. Upgraded fabrics and carpeted floors were also part of the deal-leo. Doc and I vote for Fire Engine Red! the bright red. I think it's a good plan. Thanks for the pics John. You have the same bluish door panels that I do, so it looks like they do fade from green to blue quite easily. Either that, or that is the color they were made. I don't believe mine have faded, the pale blue is uniform, so I reckon it is stock. I like the darker metallic green paint on the dash, contrasting with the very pale green on the glove box and instrument panel. Excellent, complimentary colours, just like the skin and flesh of an avocado pear. I love that glove box, from the outside it promises so much (enough space for 50 pairs of gloves worth) but when you open it, it delivers so little! It does say road maps though, which is some consolation. Location: So. California Thanks for the info Mike! Sounds like I had better hang onto that sombrero. I do really enjoy having those dippy seats. Much better looking IMO. Doc, I have no idea what the connection of those two things are, but please don't educate me. Sometimes ignorance really is bliss. John, yeah, I like the two shades of greens together too. I am not sure about the blues and greens though. I may die my door panels.... but I may just leave them too. My '57 Windsor parts car came to the rescue again. I removed the seat mechanism and found that I have no idea how to fix it. It is fully latched, but the latch did nothing and it just slid around. Looks like I would have to remove the rivets that are holding it together to even figure out if I could fix it. But fortunately, I kept the mechanisms from the Windsor and just installed that. Worked out great. So much better now. Location: So. California I also finished installing the brake light switch. I welded a piece of angle iron to the pedal bracket, but cut it to clear the spring and pushrod bolt. I also rounded most of the edges to make it more safe when I have my head up in there. I threaded the bracket with 1/2-20 thread so that I only need to use one jam nut to tighten it in place. That makes it a lot easier to set in place and more sturdy too. After I finsished it, I took the car for another test drive and my generator suddenly started working for no reason. Weird. Everything works well enough to drive now. Time to set up an appointment at the DMV so that I can do a VIN verification. It has a California title, but it hasn't been registered since 1990 so it fell out of the system. Location: So. California Scored today. Got a set of dog dish caps for the car for a very reasonable price! Anyone know how hard and expensive is it to re-plate the centers on these? Scored today. Got a set of dog dish caps for the car for a very reasonable price! Anyone know how hard and expensive is it to re-plate the centers on these? Great score! It wasn't actual electroplate. It was a gold "coating", or paint. Lacquer thinner or paint remover will take it right off! I wish Neil could chime in here! He did research on what this coating was. Same as what was used on the Q panel shields and lances. Location: So. California Thanks for the info Greg, and thanks a lot for selling me the Lancer emblems. I put them in place temporarily and they really do transform the look of the car! I also replaced the tired lenses on the car. I was surprised at how much cheaper they are than the Chrysler & DeSoto lenses. I also removed the rusted rear exhaust pipe, but kept the good section from the muffler forward and turned it out to the side to make it easy without spending a lot of money and effort on the exhaust right now. Apparently there is a guy in LA that can selectively plate these things in gold. I am going to take a look at my friend's car who had it done and check out how well it comes out. But the next thing I am working on is to replace the trunk lid with the one I got from John. It needs some work before it can go on, unfortunately, but not too difficult. Location: California She's looking great! Is that the same car that sat next to a small lake north of Dodger stadium for a long time? Nathan, remove the old color first, then get some yellow toner from the paint store, along with some urethane clearcoat. Put several drops of toner into several ounces of clear, mix well, then try a sample on a piece of tin foil. Add toner until the desired gold is achieved, then use Scotch-Brite to scuff the knight's heads, and spray directly on. The more coats the darker the color. Location: So. California Thanks Paul. I'm not sure, but maybe not. I bought it from a guy in Whittier. He had it only a couple years and the last person to register it, lived just North of Napa valley. Thanks for the tip John. I'll give that a try and see how it goes. Good score on the hubcaps! Four '57s and one '58. Gold plate will give it a super shiny look, you can get about the same from a gold lacquer sold at Hobby Lobby. Here are a couple of images of my Minty green car to whet your appetite! Location: So. California Are you saying that the '58 cap didn't have gold knights and had a black background around it instead? Thanks for the link. Your car looks awesome! I am really jealous. Do you know where I can get re-pops of the exhaust deflectors that mount to the bumper? Thanks for the info Greg, and thanks a lot for selling me the Lancer emblems. I put them in place temporarily and they really do transform the look of the car! . Oh, yeah, they bring the car to life!! Seems silly! But they really do. Rustoleum has the best gold paint. their new metallic. Probably gunna copy your brake light switch idea. Are you saying that the '58 cap didn't have gold knights and had a black background around it instead? You are correct, Nathan. The '58 hub caps (like the standard wheel covers) did not have a gold helmet and instead had a black background in the circular area surrounding the helmet. If you wanted to go stock, you wouldn't even have to worry about gold plating this or gold painting that. The black background is much easier to paint-match! There was somebody re-popping those deflectors recently - good price too! Most '58 Dodges had Eggshell-painted wheels with a gray center. However, cars equipped with hub caps (and perhaps others) could have body-color painted wheels. In your case, this would still be Eggshell. However, if you wanted to paint your car Mint Green and have hub caps, you could paint your wheels Mint Green with some reasonable expectation the factory would have done the same. Also, with two-toning on '58 Dodges, you could go with a standard two-tone, deluxe two-tone, saddle two-tone (requires different trim), or even the Regal two-tone (requires a heck of a lot of different and unobtainable trim). My car was originally a deluxe two-tone, but I switched it to a saddle two-tone by adding Spring Special trim. The saddle may also be accomplished with the '57 rear-quarter trim. It looks like your photoshop sets are all going to the deluxe two-toning (which is great), but it might be worth looking at all the options - save Regal two-toning. Location: So. California Thanks Diesel, but red is out of the question. I am really liking the green. But it definitely won't stay all-white as it was born. That is just too boring. Thanks for the link Mike. I found the exhaust tips under the seller vansautollc, still for sale. Sweet. I want to flatten/oval the pipe so that I can extend it into the deflector farther to prevent exhaust soot from getting between it and the bumper. That's the plan anyway. I may have to modify that pipe mount a bit. That's why I don't want expensive originals, but these re-pops ain't cheap either. I am not familiar with the standard two-tone. Would that be to only paint the roof a different color, or what does it look like? As far as converting to a saddle two-tone, I really like the color combo of that style, but I also really like the positioning of the emblem at the end of the trim on the deluxe two-tone. Gives the car a nice flair, even if the color isn't as nicely proportioned. So I am undecided. But currently, I don't have the trim for a '57 style treatment, so the default is what I have. Location: The Mile High City Hi, Nathan - yes, the standard two-tone is just the roof, which is a bit more unusual to see these days. There is nothing wrong with the deluxe two-tone - I like it too! The deluxe two-tone is probably the most commonly seen two-tone treatment on a '58 Dodge, and there is probably a good reason for its popularity! Location: So. California Thanks for letting me pick your brain Mike, you're awesome. I bought a really nice set of hood ornaments and got them installed and finally got it registered. Now I can drive it around *legally* But I'm quickly losing what's left of my steering wheel to the floor pan. Looks like I am going to have to spend the money to get it recast if I can't find a good replacement. The tires on this car are only temporary until I can purchase a new set. I stole these off my '57 Windsor. Location: So. California I have been working on the new trunk lid that I got from John. I welded up all the letter & trim holes since this was from a '57 CRL. It also had a small amount of rust damage on the underside of it that I have mostly fixed. Still needs a little bit more work and I need to make a template to drill the holes for the Dodge emblem, but I should finish it up on Thanksgiving weekend. It has these 4 holes on the underside of it for some reason. Are these done by a previous owner or were these used for some dealer accessory that mounts to the underside of the trunk lid? I guess I will just weld them back in. trunklids on these cars are no fun... rust just keeps going and going around the bottoms. I did pour mine full of por15 when I got done and opened up the drain holes real good. Location: Sept. 1958 Dodge is looking nice Nathan! Location: So. California Thanks Matt and Mike. I got tired of driving it with parts of the steering wheel falling off into my lap, and holding onto the bare wire. So I installed this Chrysler wheel until I can either recast my old one, or get a different wheel. I bought this wheel from Fall Fling in October for a whopping $10. Not a perfect match in color, but close enough and should work well until I can get the right wheel in there. Location: Buena Park, CA I know that steering wheel! Looks good in there. Nathan and I did several passes with that seller. He scored a cart full of fun, I walked away with a Highway Hi-Fi for $40. Location: So. California Yes, that was a good day! My Coronet scored 2 rear speaker grilles as well. How's the Hi-Fi coming along? Sinister ? Why would anyone want their 58 Dodge to look "sinister" ? How about elegant ? Harry Truman had a nice 58 Dodge coupe. Or you could paint it all brown. Makes any car look like a turd ! Mopar Geezer would approve ! Location: So. California I want to convert this car to run a 4bbl, but the intake manifold is setup for the small WCFB. After digging through my garage, I found an NOS rebuilt carb that I had picked up for my '56 Plymouth back in 2003. The number on the box is 14-18 by Champion Re-builders. This carb looks like it is made for this intake, but would I be better off machining the intake for an AVS carb from a 340 instead that I know I will like? Does anyone have first hand experience with these carbs that can tell me if I should use it or not? Location: So. California Oh, and by the way, that brass vacuum setup is going to be used to convert to a PCV setup. I don't like using the downdraft tube, it creates too much oil vapors that are obnoxious when sitting, idling at a light. But with a larger, newer carb, I could connect the PCV to the base of the carb instead, which would be better too. It is looking like this one is going to get some buzzard puke on it too. The wife approves the mint/white w/whitewall combo, but I think I prefer the charcoal/mint w/dog dishes. The wife says darker green/black makes it look like an army jeep! So I guess that one is out. I'm looking forward to the day your buzzard starts busting those boulevards again. This was my old car , couple of owners after I restored it added the Gold bling and wheels? Location: So. California And I gratuitously spewed green goo all over it without even blinking an eye. Sorry Looks like you shouldn't have gotten rid of it. Pretty nice little cruiser even after it got touched by king Midas. My car received some new shoes this week. 255/275x60 series tires on 15x8 wheels with zero offset. I decided that what I liked most about the '58 Dodge is that it seems to be the Forwardlook muscle car; much more-so than the other brands. So I am going for a '50's muscle car look and I am going to paint the top black to match the wheels. I was originally going to put some trim rings onto them as well, but I thought they ruined the look so I took them back off. I really like the gold knight on the black background so I am going to paint the one silver odd-ball gold to match the others (hopefully). The rear tires fit perfectly and you probably couldn't go much bigger unless you move the springs inward. The front rims contacted the front corners of the '99 Dodge truck brake calipers a little bit so I ground the corners of the calipers down a bit to clear. Other than that, they fill very well too. Location: So. California Here is what the car looks like now with these on. Location: Alberta Nice wheels I always wondered what the Dog Dish caps would look like on my 57 2dr sedan that I'm currently working on. The 15" Wheels do fit …………. nice as I was doubting that even after reading that the famous 57 2dr 354 cu in/dual 4bbl ran 15" tires. I seen a set of hubcaps like this on epay a while back are yours the ones? Location: So. California Probably not. I bought a single one on ebay from someone local, and met the guy in person to pick it up. Turned out he had 5 that he sold me. Location: little rock, AR I know how excited you are being able to drive it as none of of mine have ever gotten to the paint stage. Hell, the one I'm driving now hasn't even received a windshield. lol If you want to see original door panel colors take off the door trim to expose the top part of the panel. I have a couple of those dog dish caps but that style didn't come on a '59. Keep up the hard work!!! I love it, Nathan! That's exactly how I did my hub caps - the best of both worlds! Location: So. California Yeah, Dorsey, life is too short to wait to enjoy it! But of all my vehicles, this one will get painted first. Mainly because it requires the least body work to complete and really needs some other colors on it. Once I get the trunk weatherstripping channel fixed, I will go ahead and paint the top & fins black - maybe even before fixing the trunk floor. But in the meantime, let's go for a ride! Mike: Great minds think alike The black background on the '58 version makes it look a lot better IMO. Location: DFW, TX I think that car would look pretty tough in all-black! Whatever you decide to do will look great. It's coming along very nicely. I see you have a Dodge, Plymouth, Desoto, Chrysler, and Valiant. If you have an Imperial, you'd have all the Mopar makes under one roof, quite an accomplishment. Location: Buena Park, CA Digging that all black ^^^^ with the Dog Dishs. darn Nathan, I wish I had your work ethic . . . . when you get a new ride, you really go to work on it. And those new shoes really look great. Regretfully I have done nothing with the Highway HiFi yet, just living vicariously through you. Location: MN As a Lad I owned a used all black 57 Coronet Lancer D500 3spd column, which I owned for several mo until I got sick then Dad sold it. Mine had white walls & Lancer spinners. The Lancer wheel cover was a hot item stolen often from cars around dance halls! Location: So. California I must admit that all black looks REALLY good. What kind of caps is he using though? Very odd looking. I have ruled out creating the pastel green cream-puff that my wife likes. I decided that I just don't care to have a '58 Dodge in these light pastels. My current plans are a dark green and black, but I could go for a black and white, all black or something else entirely. My Dodge Lancer isn't quite a Valiant, and I have no aspirations to obtain an Imperial either so sorry, the complete brand thing isn't going to happen. Dave, I am spending my time buying wheels because I can't get much work done with this weird weather. I hope it lets up soon or I may go broke! But the extra water here is a nice change. Location: DFW, TX Sorry, it was a quicky photoshop I did of a Coronet and some dog dish caps. Apparently from a '65 Galaxie. Location: So. California Nice, that makes more sense now. Location: So. California I installed lap belts & replaced the muffler in the car yesterday. The last work to do before moving on to working on the New Yorker. Once the front seat foam stops disintegrating under it, I will paint the floor and install a carpet in there. but this car has become a pretty nice driver so I am going to enjoy it for a little while. Location: So. California How is this? Silver is a tough color to photoshop because it doesn't get the same sparkle, but this is about the right shade, I think. Location: MN Thank you, always loved the 57's but the dark blue & silver 58s are a super favorite. that light green white, and dark blue/silver are sweet. Powerflite: A nice job you did with Photoshop! Impressive how a color affects the aspect of a car. A low-cost way for evaluation. Location: Kennewick Wa Nathan, My plan is to put dog dish caps on my '57 Sierra wagon. What wheels are you using that are 15x8 and will take the dog dish caps? Location: So. California Here is a better picture of the wheels. The wheels are Wheel Vintiques original Chrysler style 63 series. I purchased them through Summit Racing. These wheels are made for the '60's cars, but you can use them with the older caps if you get some small 1/2" OD spacers and weld them to the mounting nubs on the wheels. This spaces them out perfectly to fit the bigger caps. Make sure you re-balance your wheel afterward, but as long as you don't go crazy with the welding, it shouldn't affect your balance too much. The tires are Cooper Cobra's. They have a really cool snake embossed on the black side of the tire that looks pretty cool. I am pretty happy with this setup, and it gives me the look I was hoping for. Location: So. California I picked up a steering wheel that is in much better shape than my original, but still needed a lot of repair. Koch's told me that it was too far gone to repair with their resin filler and they don't have a mold for it. Drat. They charge half of what other people want for a newly molded wheel. I would have paid them at their price level, but not at the $1200 point that others want. So I decided to fix it myself like I did to my '57 Windsor wheel. That wheel has held up very well over the last 5 yrs or so in the heat of the sun so I was very pleased with the results. To repair this, I sanded the entire top portion down really well, and inside all the cracks to loosen whatever was going to come off and provide a good surface for the filler. Then I *pressed* Duraglass into all the cracks with my fingers and smoothed it out as much as possible. Duraglass is bondo with fiberglass filler. It dries much harder than regular bondo and can hold it's shape better when used in thicker amounts. Seems to work well for this application. After sanding it is looking much better. It needs a second application to get areas that I didn't apply enough material, but after that, I will seal it with a good primer. I decided to not paint this the stock turquoise colors. I will paint the top a light green color to match my dash and leave the bottom black, just like Rosie's wheel. Location: So. California I finished repairing my new steering wheel. It isn't as good as having a newly re-cast wheel, but this one really didn't cost me anything; and $1300 is just outside my price limit for these things. I also added a new horn ring since mine was quite pitted and I painted it up too. I think this is a '57 style horn ring, but oh well, can't have everything. I had some interference between the inside ring mount and the bottom inside of the wheel. Not sure why, unless it is because of a difference between '57 and '58. But I filed the sharp edges off the ring mount and ground down the inside of the wheel a little to make it work. I also had to grind a flat on the horn switch so it would clear too. Weird that my '58 wheel didn't seem to need it. Location: Newark, Texas (Fort Worth) Don't sell yourself short. That wheel looks fantastic! Location: So. California Thanks Marc! It'll be great to finally get a Dodge wheel back on the car. The Chrysler wheel is a little too deep to be comfortable in the Dodge. I didn't know there was a difference in depth before I tried it on there. Location: Williams California Nice work on that steering wheel!! Location: The Mile High City Sweet work on that wheel, Nathan! That is one you can be proud of! Beats the snap out of paying $1,300 cold hard American! Location: So. California Thanks Mike! I like it too, but without the bottom horn ring contact, the wheel has a bunch of ribs that catch on the horn roller contact and causes no end of trouble. So I can't use it until I get that fixed. So I am playing musical wheels with it in the meantime....this time from a Plymouth I also installed a speedometer that works with a much nicer bezel on it and a right side mirror. Location: So. California I just need a gumball flasher, siren and dash mounted shotgun to go with it. Location: The Mile High City Nathan, you got me inspired! I am repainting the De Soto steering wheel now. Location: So. California Go for it Mike! You really have nothing to lose. If you mess it up, you can still pay big bucks to get it re-molded. I cut out a ring for my horn contact today. Then I brazed a layer of brass on the bottom side to help prevent corrosion and put a spot of brass on the top side too in order to solder the electrical wire to it. I ended up grinding through the brass in 2 spots, but it should be alright anyway because I will cover it with dielectric grease. After it was done, I layed it into the wheel and welded it to the center hub. I dowsed the plate after each weld to cool it and prevent the soldered wire from melting and coming loose. I don't normally recommend welding on a piece of rug, but I thought it was worth the risk to catch it on fire in order to save the paint. Hopefully there won't be any interference issues with the turn signal, but if so, I will just grind the welds down until all is good. But I don't think it will end up being that close. I would have put it on today, but I had my limit of heat exposure for the day so I will save it for later. Location: So. California For future reference, this is the wiring on the back of the fuel & ammeter gauges, as well as the light switch wiring on my '58 Dodge. Location: So. California I went to install the wheel and realized I really goofed. The way I have it setup, the horn is always connected to ground through the welds to the hub. So the original copper plate that is held by the hub must be electrically isolated somehow. I have no idea how I would do it here. Maybe I can cut the center hole extra large and epoxy it to the hub? Not sure how well that would hold it in place though. I am tempted to just put a button on the dash for the horn at this point. Location: Quebec, Canada Why not just install the correct part instead? They are not so hard to find, I might even have one here in a parts drawer. Location: Williams California Yes, David is correct. The horn contact rings are removable, there is no such thing as a 'power steering' steering wheel, as many proclaim, they are all the same with the exception of the removable horn contact ring. Location: So. California On my original wheel it is definitely not removeable. But I can't figure out how it isn't shorting out on the hub either?? If you have one of these I could install, I would be very thankful. On my original wheel it is definitely not removeable. But I can't figure out how it isn't shorting out on the hub either?? That brass ring is made to be removeable. It is cramped tight against the hub, but it comes out, that's for sure, unless your wheel was modified and not original. The original brass ring has a smaller rubber ring inside the hole for the hub, so it does not short on the hub. I will go in my garage right and try to find it.. I just hope I still have it. If I do find it, I will send it to you for the price of shipping only. Location: So. California Thanks David! Searched all over my garage, and I cannot find it!... I might have given it to a guy last year who wanted to do a conversion to power steering in his 1958 Dodge. Sorry! But Big M or someone else on this board should have one, they are not that rare. Location: northern germany that steering wheel looks perfect, great work! nice color combo too! love 58 dodges. Location: So. California Thanks for looking David. I probably need to find one because I don't see how to make it work well doing a home-made approach. Thanks Sid, I'll like it too once I can start to use it. Location: So. California The 2bbl carb was giving me all sorts of trouble with the float sticking open or something like that, so that it was constantly dribbling fuel down the throat of the motor. That made it very difficult to start after driving it because it was always flooded. When I checked the oil last week, I noticed that it was overfull - by about 3 quarts with a strong gasoline smell to it. Not good. The motor has also always had multiple lifters that were making a lot of noise and never quieted down. So I removed the intake & valve covers and replaced the lifters with new ones. All the lobes on the cam looked good so I felt confident that it would solve the problem. The gasoline in the oil had dried out the gunk in the motor so I vacuumed and cleaned it out of the heads & lifter valley the best I could. I drained the oil and then flushed the valley with new oil to hopefully flush out any extra debri that was still in the motor. I installed a new 30 degree style oil filter with an adapter from Hot Heads to hopefully catch the gunk a little better than the original style filter. After that, I primed the oil pump with the new oil so that I would have good oil on the crank bearings before I start turning the motor again. I then installed the 4bbl intake I purchased from BigM and a matching WCFB carburetor. I bought this new/old re-manufactured carb for my '56 Plymouth back in 2004 and never ended up using it. I also removed the downdraft tube and installed a 426 hemi style PCV setup on the right valve cover. I tied it into a Tee on the intake with the vacuum switch. Unfortunately, it started raining on me just as I was finishing it up. But I managed to snap a photo right before I installed a fuel line & new pump in the rain. During startup, the carb initially started dribbling fuel down it's throat, but after a whack with a dead blow, it stopped. Hopefully it doesn't do that again. I'll keep an eye on it for a while to make sure. I don't want a repeat of this lovely experience. After that, it ran well and had good oil pressure throughout the run around the block, in the rain, with really old wipers, and...... no lifter noise! Yay, mission accomplished. I have an air cleaner for the 4bbl, but it needs a little body work done on it before it's ready for paint. Location: So. California I purchased an NOS knight emblem from Ebay, but I can't decide if I like it on the grille or not. Without it, the Coronet looks more bare-bones and muscular, but it does look quite nice on there too. What do you think? I purchased an NOS knight emblem from Ebay, but I can't decide if I like it on the grille or not. Without it, the Coronet looks more bare-bones and muscular, but it does look quite nice on there too. What do you think? Gotta have it! It adds charm to the muscle! Location: So. California I think you are right Greg. I am liking it more and more. Yesterday, I finally fixed the dash lights on this car. First I attempted to install a good '56 Dodge light switch in place of the original '58 Dodge version. I used some lug adapters to convert to the existing terminal on the wires so I didn't have to change the wiring. The switch worked, but I couldn't get it installed into the dash because it collided with the structure on the backside of the dash. So I decided to take the original switch apart and fix it. It wasn't very difficult to fix. It just required cleaning all the contacts and applying electrical grease to protect it afterward. The contact from the rheostat wire to the internal contact was the hardest part to do, but I managed to make it work by using a very small file all around where the wire enters into it. Re-crimping the housing is never as tight as when the factory did it, but it is close. I should have taken pictures of it apart for future reference, but I neglected to do it. Sorry. Location: So. California Took the family to Oro Grande Days in the Coronet and entered it in the small car show there. The Stagecoach Olds creation was unexpected and neat to see. It was pretty fun for being a small place. We trolled the numerous antique shops there and was surprised to find an original propane tank for my Kit teardrop trailer! It was really cheap too, compared to getting it from someone who knew what it was originally from. I also picked up an old fuel can to replace the utter garbage versions that they sell today. Oro Grande is just North of Victorville and lies right on Route 66 so there are a couple of neat things to see around there, including an old metal truss bridge from the 30's, a couple of old motels & gas stations. We also went to the route 66 museum in Victorville too. Afterward we headed to just South of Lancaster to take a hike in the Devil's Punchbowl. That was really neat and I recommend anyone to check it out if you are in the area! The only issue we had with the Coronet was that we hit a couple of regularly spaced bumps or dips in the fast lane at a high speed turn and the inside rear tire seemed to hit resonance and immediately bottomed out 3 times to the point that it was a little scary. My car sits pretty well in the rear, even with all my family in there, but nevertheless, the rear springs just aren't as stiff as they should be to handle very well. 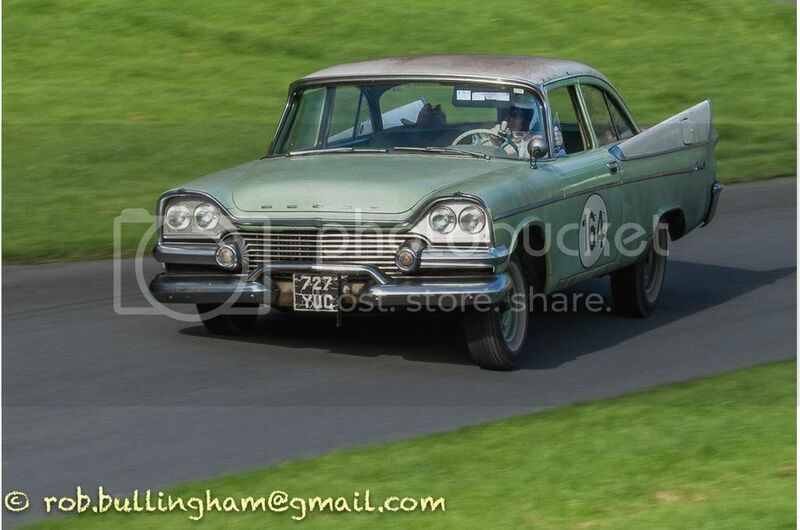 My '58 DeSoto with its new (stiffer) rear springs & front sway bar handles soooo much better than this car. Oh there was another issue. The starter switch on the neutral button just decided to stop working....of course. It's worked great the whole time I've had the car, but today it decided to stop. I kept a piece of wire handy in the car for emergencies so it wasn't a big deal except that I had to hot wire it every time I needed to start it again. Location: So. California I like the design of the tee shirt that came with show registration. Location: DFW, TX Looks like a great trip with the family! Awesome pics, I'm sure you all made lasting memories in that ol' Dodge. Cool beans, Nathan! Looks like a great trip! Yep, that's the perfect time to drive 'em. BTW, I like the lancer grille emblem. I bet you got a lot of compliments on the road trip! Location: So. California I did get some nice comments Mike, mostly from people who had never seen one before and were surprised by the sleek roofline and cool fins. These gauges showed up yesterday from Bogota, Columbia. Nice set of gauges with near perfect chrome. This is going to make my dash look.....dashing! Location: So. California I drove the car to work today, and while cruising at 75mph on the freeway, the car suddenly started making a huge racket. When I pulled over, I found that the rubber boot for the ball & trunion had ripped & loosened and was whacking itself on the floor. Of course, there is an ample amount of grease on the floor now too. So I just turned up the tunes and tried to ignore it, but it doesn't seem to want to come off on its own. I'll have to live with the noise until I can get it back home to deal with it. I didn't really want to convert it to a slip-yoke setup yet, but it looks like it has become a priority now. I didn't really want to convert it to a slip-yoke setup yet, but it looks like it has become a priority now. Why for heavens sake would anyone convert to a heavy and inferior external slip yoke? The OE B&T is superior in every way and one of the outstanding (properly serviced) indestructible FL features. Mine, that has a very hard life behind a 383 and a 2.93 axle, is still like new with over 330k on it. If yours spewed grease after the boot failed, it wasn't properly serviced. There is no grease supposed to be behind the boot. Its a DUST-boot not a grease seal. Its not designed to carry grease only its own weight. Do not exceed the amount of grease given in the fsm, which is only 2 ounces. Keep it MoPar. Location: So. California If it was a slip yoke with a standard U-joint, we wouldn't be having this conversation. B&T are a pain in the neck, and bound to failure eventually. not to mention unobtainable parts and difficulty to balance. No thanks. I wish Chrysler had used a slip yoke much earlier than '65. If it was a slip yoke with a standard U-joint, we wouldn't be having this conversation. B&T are a pain in the neck, and bound to failure eventually. not to mention unobtainable parts and difficulty to balance. No thanks. I wish Chrysler had used a slip yoke much earlier than '65. Not at all and it works for me for 30 years without any problems, as i said, 330k miles just in one car, still like new. rebuid kits are readily available for much less than the cost of a slip-yoke conversion. try to rebuild a slip-yoke. not possible. welding required. ask the 50s GM guys about their external slip-yokes and how reliable they are, these are bound for failure and vibration. I never had any problems with the B&T in my cars. The B&T is the superior design, for several reasons, as every mechanic/engineer knows, but over the years (I drive FL almost daily for decades) replaced several cross/rollers. yes, if you carry grease in the boot it can cause vibration and will cause boot failure, but as i said, theres no grease supposed to be there. don't blame an excellent design because of poor service. the best parts break if you do not treat them properly. just service it as per fsm and it will last forever. Location: So. California The brake pedal started to increase it's travel bit by bit until it suddenly came pretty close to the floor. So I took the rear brakes apart and eventually found that the adjuster tab on the rear brake shoe had bent over so that the adjuster didn't make contact with it anymore. Also, the round spring clip that holds the adjuster to the main structure had broken off. Great. After a lot of effort, I managed to get the spring clip back into place and I clamped down on it to get it as close to the original position as possible, then I welded it to the adjuster pin in multiple places to make sure it wouldn't move again. I tried bending the tab on the brake shoe back into position, but it was really soft and immediately broke off. So I pulled a brake shoe from the front of my '58 New Yorker, that had good ones on it, and replaced the bad one on the Coronet. After that, I put it back together and I was able to adjust the shoes like normal again. Drove the car, and the brakes feel like new. Nice, ready for use again. Location: So. California I welded sway bar brackets and mounted a bar from a Dodge based '58 Windsor yesterday. It was difficult to weld with everything in the way, but it came out fine. The links seem a little long because the bar will rub on the strut bars under a hard turn while braking. But the brackets are at the top of the frame, so I don't know why there would be an issue. I will just shorten them up a little to move them out of the way. Having shorter links is better anyway. But the car handles much better now. Even with a 3/4" bar, the sway is dramatically reduced. Location: So. California A little camping at the beach fun. High speed turns are much more enjoyable now with the sway bar in there. Location: So. California I had planned to hitch up the teardrop trailer to our '56 Savoy and take that to the Sierra mountains this weekend, but once it was loaded down, it started losing power and backfiring quite a bit. No amount of timing adjustment could fix it. I figure it may be too much slack in the timing chain that is causing it. Anyway, we re-packed our stuff into the Coronet instead and took that without the trailer since it doesn't have a hitch on it. Was a little crowded with 6 people and all their stuff, but that trunk is huge and we got it to fit! Had a great time and the car worked perfectly except that I found out that the raised lettering on the inside of the right front tire will rub the upper control arm when the car is loaded down and you hit a bump - or corner a hard left. The right side only. Weird, but it wasn't a big deal, just occasionally annoying. I will look to see what I can do about it when I get under it again. The high gears in this car make it very enjoyable to drive on the freeway. We went 75-80 mph most of the way there. Great pics, Nathan! Thanks for sharing. Location: So. California Thanks Mike. I figured I would start to show a couple of the more fun ways I use the car since I am not working on it as much as I used to. But improving the sunvisors is next on the work list for it. Location: North Australia You had the coolest camping vehicle in the park I recon! Nice pics. Which park is that? Steve. Location: So. California We really did! It was funny when a Filipino couple saw it and took their picture in front of our car. There tends to be a lot of foreign visitors in these camps, but I also had a good chat with a Chevy guy who camped next to us. This was in King's Canyon near the end of the road. I was hoping to buy some gas from the old gas station that I used in the '70 Satellite 4 years earlier, but it had burned down from a fire that went through there in 2015. Glad we had the chance to use it while it was still around, only 1 year before it was gone. Hello, I enjoyed our conversation last night at the cruise-in at Bobs in Northridge. I have the Black 55 Dodge! See you Soon! At some Car Show or Cruise Night! Location: So. California It was great to meet you Ernie. Thanks for the A/C tips too! Location: So. California I finally got the sunvisors installed. Only took me about a year! The new visors were made to work with the later style rod that is one uniform size, 5/16" diameter. My original rods are more like .35" instead. Not a big difference, but enough that it won't work because they make them to fit very tight. I could have cut the originals down on a lathe, and then cut them shorter, but I don't have access to a machine shop right now, so I just welded rods from newer sunvisors onto the old ones. Not as clean as I would like it, but it works and isn't bad. I Had a great time and the car worked perfectly except that I found out that the raised lettering on the inside of the right front tire will rub the upper control arm when the car is loaded down and you hit a bump - or corner a hard left. The right side only. Weird, but it wasn't a big deal, just occasionally annoying. I will look to see what I can do about it when I get under it again. The high gears in this car make it very enjoyable to drive on the freeway. We went 75-80 mph most of the way there. Surely your tyres are rubbing because you've fat radials on there?? Stick some useless old BBs on & the trouble will disappear. Location: So. California Change tires? Never would have thought of that. I made this bracket to attach the knight's crest to the grill. It looks similar to the original bracket. How should I secure it to the emblem? The pins on the emblem are tapered so it looks like it is meant to just use a friction force to hold it in place. I am not real fond of that approach because taking it back off can be dangerous to the pins. I would rather widen the holes and use some nuts to secure it, but I am not sure how well the nuts will work with those tapered pins. Any advice for this from those people with experience? Location: So. California Are these barrel nuts the right approach? Connect them to the bracket and slide the emblem in them? I assume that you grip on those little tangs and that will release the pressure to be able to remove it. How well do they work? Might be tough to do that simultaneously to both pins. Location: Sept. 1958 They have nuts that hold them on, the kind that cut their threads. Have a photo, but too large. Location: So. California Cool. So they just used regular emblem nuts on them. Strange that they would make the pins so long and tapered for that. But I like that method the best if it works well. Your picture wasn't too big, it had the wrong file extension as .jpeg instead of .jpg. Location: Sept. 1958 Yeah, I modified it, unfortunately with my iPhone all photos are jpeg. Location: So. California My oldest daughter took a video of us riding home in our Coronet near Fresno, California as we came up to a '57 Chevy cruising along. The audio was boring so I dubbed something more interesting over it. Location: So. California I bought this lower trim to mount the dash pad to my car. I was originally thinking I would just modify the painted steel trim from the Chrysler to do the job, but I was surprised to find out that the Dodge version is made from pot metal and chromed. It is also more complicated, running along the right side of the dash in two directions, whereas the Chrysler version is just a slightly contoured, straight piece of steel. Were they all like this, or is this a Custom Royal version only? I think any 1958 Dodge, regardless of model or body style, that had the padded dash option (or safety option group - as it was one of the components) came equipped with the chrome pot metal piece. It is kinda cool! BTW: I used plastic nuts on some of my emblem pins and they work really well without chewing up the pins. Something to check out. Location: So. California Plastic nuts, sounds interesting. They don't make thread cutting versions, I assume; so what thread size did you use? 10-24 maybe? I like that idea because it wouldn't affect the integrity of your pot metal from corrosion of the nut. This car has very nice floors for the most part. Not a bit of rust on it anywhere except for under this rear seat brace. That thing is rusted quite heavily with a couple of rust holes in the floor underneath it. So I extracted the brace from the really rusty 300D that I parted out. Weird that that car was so rusty you couldn't possibly save it, but it nevertheless had a good seat brace on it. I can even see clean, bare metal on the underside of it. After I get this replaced, I will install new carpeting in the car. My oldest daughter took a video of us riding home in our Coronet near Fresno, California as we came up to a '57 Chevy cruising along. The audio was boring so I dubbed something more interesting over it. Location: North Australia Nice video, why has that Kid got green stuff coming out of her ears?? Nice to see your Kids cruising. A crusty 58 Dodge 2drht beats a 57 Chev sedan any day of the week in my book. Location: So. California Especially a sloooow Chevy My noisy old window gaskets aren't going to get replaced until a new source for them comes up. Hopefully someone will be able to take over Gary's operation. But it isn't bad for short runs; it's just that on a 3.5 hour drive, your hearing can suffer with a constant noise like that so I make my kids wear ear plugs. The real question is why isn't my son wearing them! The trunk lid I bought from John had this license plate panel rusted, probably from storing the lid with this area up, catching a lot of water and dirt in there. So I cut that section from my original and kept it for future use. Today, I separated it from the remainder of the trunk lid that it was welded to. Sandblasting it now will make it so I don't have to sandblast the whole lid later. Hopefully, I can find time to get it welded into the lid in the near future, but I need to figure out how to remove that die cast panel from around it first. On this one it was easy because I had access to the tabs holding it once I cut the section out, but on the new one, I am afraid of breaking it trying to get it out. Location: So. California Thanks to John at BigM, I was able to pickup an E-brake light & switch for the car as well as a map light and the rest of the pad trim. The red lens is a little melted from the previous bulb, but it's livable. I haven't figured out what bulb it needs yet. It has 2 contacts on it, which is weird for a single sensor light. Anyone have a recommendation for a bulb or preferably a red LED light to put into here? Location: Southern Sweden - Sturkö island Most probably it's an insulated BA9s receptacle with one 12VDC power lead and one ground lead that Close the Circuit via the emergency brake switch. Thanks to John at BigM, I was able to pickup an E-brake light & switch for the car as well as a map light and the rest of the pad trim. The red lens is a little melted from the previous bulb, but it's livable. I haven't figured out what bulb it needs yet. It has 2 contacts on it, which is weird for a single sensor light. Anyone have a recommendation for a bulb or preferably a red LED light to put into here? I think that the issue with the melted lens is because the factory wired the warning light so it comes on in both ACC and RUN. So if you were sitting with the car and/or engine stopped in Neutral and eBrake engaged and the key turned to ACC so you could listen to the radio while you worked on the engine (or in the trunk), the eBrake warning light would be on the hole time = incandescent heat = melted plastic. I went through looking for a replacement bulb for mine and found that it was a standard GE 90. That said, I am looking at a) re-wiring the eBrake warning light so it is only powered in the RUN position of the ignition, NOT ACC and b) looking for that BA9s LED bulb that Sven pointed out. Location: So. California Thanks Sven & Dave. The GE 90 definitely looks like the correct bulb with 2 contacts on it, but the BA9s doesn't look like it will work because it only has one contact. So looks like we need a different LED than that one. Location: Southern Sweden - Sturkö island The GE 90 is a BA15D bulb, hence bigger in diameter (15mm) than a BA9s (9mm). Location: So. California It looks like 1178 or 1142 are other numbers with similar specifications. The trick is to get an LED that is short enough to fit. This one looks like it should work for this purpose. I am going to purchase a pair of them and give them a try. Hopefully they aren't garbage production versions like a lot of these things built with superior Chinese quality assurance. I finally got some of the small painting projects done. I was really happy to pick up this nearly perfect horn ring from epay. Cleaned and painted, it looks really nice. Anyone want to buy my old lightly pitted one? I also finished painting the gold hubcaps so they all match now. It's hard to see in the picture, but I also painted the ribs on the sides to make them stand out better. Thanks Sven & Dave. The GE 90 definitely looks like the correct bulb with 2 contacts on it, but the BA9s doesn't look like it will work because it only has one contact. So looks like we need a different LED than that one. I received the LED's yesterday and tried them out today. Unfortunately, I don't know if an LED exists that will work here. It really can't be any bigger in diameter than the base. I couldn't get these to seat into the socket because the larger top section interferred with the tangs that hold the socket to the bezel. If you could get it seated, the larger diameter does fit inside the bezel though. But it doesn't look like it is going to work that way. Back to searching....or maybe if I cut the ends off the tangs I could get it to work? But looking closely at it, it isn't going to work because it is just a little too big. I had a similar problem with my licens plate LED-bulb and had to cut the tangs slightly for to get it in - check the hole diameter and compare with the LED-bulb. Sven: Agree that the base and the single filament aspects of the 1004 and the GE 90 are similar/identical. *HOWEVER*, the size of the glass globe on the 1004 is too big to work in my 1956 eBrake warning light. Been there, tried that. Hence the GE 90 with its smaller glass globe. Location: Southern Sweden - Sturkö island Thanks' Dave, the bulbs I had in my car was tubular BA15d R10W (Now replaced with warm White LED's) - now that I made some searches, they come in tubluar or spheric versions. Thanks' Dave, the bulbs I had in my car was tubular BA15d R10W (Now replaced with warm White LED's) - now that I made some searches, they come in tubluar or spheric versions. It's all beginning to make (a little) sense now. Here is a tubular R5W that I found on the internet when I was looking before. Could NOT buy them locally. So what are the details (link?) for the LED that you are now running? Location: Southern Sweden - Sturkö island Dave, I bought el cheapo ones from Singapore - when they arrived after a looong time, I already got my refund from Epain since I was convinced that they were lost. Then I discovered that the had minus in the chassi and 2 plus poles - no good. I opened them up and resolder them correctly and they have worked for at least 3 years now. I found these ones on Epain, but they might be too strong for a brake warning light, perhaps for the dome light? I installed lap belts & replaced the muffler in the car yesterday. The last work to do before moving on to working on the New Yorker. Once the front seat foam stops disintegrating under it, I will paint the floor and install a carpet in there. but this car has become a pretty nice driver so I am going to enjoy it for a little while. I’m pretty sure the foam will stop disintegrating when there is none left to disintegrate. A few years ago the wife and I took my car to a car show about 30 miles from home. We left very early when it was cool outside and drove with the windows up. In the afternoon it was very hot and we drove home on the freeway with the windows down, sweating, seat foam dust blowing all over us and sticking to our skin, in our eyes. A few weeks later I asked the wife if she wanted to go for a Sunday cruise in the Chrys... “NO CHRYSLER” was the response, before I could even finish the question. I have towels wrapped around the base perimeter of the seat now, to contain the foam until I can get the interior done. Location: So. California Very true! I have kids that sit in the back seat and they sometimes get a nice dusting. But I keep it vacuumed out as much as possible. The amount of deposit has decreased quite a bit so I am considering putting carpet in the car now. An idea might be to slaught a 90 bulb and use the base for to solder in a BA9 red led and fill the gap with epoxy glue - correct base and slim "bulb"
Location: So. California I figured I would try out a new socket as they may give me more room for the bulb. Turns out I was right, and I can just barely make it work. But I couldn't find a BA15D socket so I converted a BA15S to dual contact using the innards from another dual terminal socket. I had to cut and bend the output section to fit the dual plug into it instead of the single wire, but once done, it seems to work well. This LED array just barely fits in the bezel so you really could use it without a lens if you wanted to, but it wouldn't look the same of course. One annoying thing is the LED had no documentation at all. 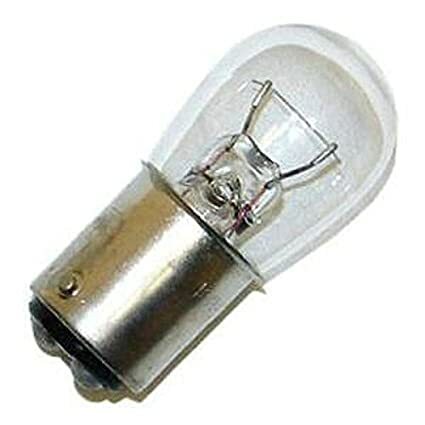 The bulb can also be inserted in either direction, but nevertheless, the LED can only work in one direction. Turns out that the red or green sticker is placed on the ground side of the LED - backwards from what I would expect it to indicate. But I didn't blow it out from placing it in the wrong direction, so that's good. Location: So. California The left fender wasn't straight. It was pushed in about 1.5" just above the wheel. Nevertheless, that didn't stop someone from filling it with bondo and calling it good. So I dug it out and will begin the process of getting it straight. It isn't going to be easy because of all the abuse it has already gone through, but I'll give it a shot. Location: So. California Well, after a lot of effort, I got the LED in place and shining. It makes a nice bright, even glow that is pleasant to look at. You really can't tell from the photo because it makes it look yellow when it is really a nice red color. However...those stinking Chinese un-engineers did it again! They made a 2 contact, single filament bulb that is also grounded to the case. What a bunch of idiots. Why in the world would you want a single filament bulb with 2 contacts that is also case grounded???? Doesn't make sense. Anyway it was all a complete waste of time and effort. I put my tail between my legs and installed a GE90 bulb into it. I probably should have done that to begin with. Location: Lower Mainland BC Seemed like you were winning with that LED so I didn't offer another alternative. Didn't work out. Too bad. Another alternative is a very inexpensive 3/4" LED truck marker light. Has its own red lens. Requires removal of the OE socket so I didn't go that way even though my neighbour gave me one. Location: So. California I figured that by the time I got that left front fender close to straight, that it would need to be shrunk and the work involved wouldn't be worth the trouble. So I purchased a new fender from BigM. This fender just has a small dent at the very front of it that I may be able to straighten using a long spoon or blunt chisel. The inner structure near the headlight doesn't look to have been affected by the dent, but nevertheless the headlight bezel is unable to mount there. So the inner structure must have been compromised by it as well. I will try straightening it and see what it looks like afterward, but if it doesn't work out, I will separate the front inner structure from the fender and weld my old inner structure to the new one. Kind of a pain, but you gotta do what you gotta do. Location: So. California Yeah, I mostly fixed the majority of the bend in the front of the fender, and banged on the inside metal quite a bit to try and move it out of the way, but no dice. I am no closer to fitting the bezel than I was before I did anything. I don't see any way of making it happen without removing the spot welds and straightening them separately. So that's the next step. There wasn't any rust holes in my original trunk lid insert for the license plate, but it had a number of rust pits that were very deep on the inside face of it. So after sandblasting it, I welded in those low spots. I had to grind & smooth the weld-thru on the other side afterward. These contoured areas aren't very easy to get to, but with a cutting tool on the end of a small die grinder, I was able to do a good job with it, even in the corner. It feels pretty straight now, and should look good once primed & painted. Location: So. California After quite a bit of work, I was able to get the bezel to fit into the insert properly. The center section had been pushed upward when the side was hit inward, but it didn't seem to affect the outer panel at the top for some reason. I have both panels reasonably straight now so I can now start welding up all the tears & extra holes created from cutting them apart. Then paint the seams & inner sections to finally be able to weld them back together again. On the plus side, at least the seams will be painted now instead of bare metal like it was from the factory. Location: So. California While I was waiting for the sealer to dry on the New Yorker, I decided to fix the rust on the right rear corner of the Coronet roof. I protected the glass with some damp rags and held them up with strong magnets. I also protected the trim with a couple layers of electrical tape. I cut the patch from a suitable section off a '58 Chevy pickup roof that happened to have the same bend in it. After I opened it up, I cleaned it out and found that the ledge next to the glass needed to be repaired. At first I was very dismayed as I didn't want to have to weld that close to the trim & rubber, but I found that by inserting a plate of copper between the trim that I was able to repair that section quite easily from the inside. I then sprayed down the inside with a rust converter and then a coat of primer/sealer. Once that was mostly dry, I welded it up. The patch came out quite well, but I had to cut out most of the leaded seam, leaving a large indentation to fill. Once the lead was out on the top end, I just welded most of the depression back in with steel. But I still need to remove the rest of the lead on the bottom end and either fill it with steel or something else. I am thinking that welding it in with steel would end up being the easiest and last better than any other option.